Osama bin Laden the al-Qaeda leader claims responsibility for Detroit underwear bomber. 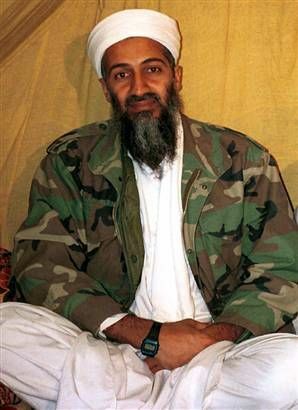 I think it is safe to steal photos of Osama Bin Laden… original work is automatically copyrighted, so there is always the danger you get sued for using a photo without permission on your travel site. Is Osama going to sue me? You must ask yourself, who is going to sue me for stealing this photo from an internet page. I suspect it was stolen also, borrowed, taken, misappropriated, etc. If I stole a photo, there could be a civil suit brought against me, the Judge would decide how much I made from using the photo, and could give punitive damages I believe. I figure, I make 80 cents per year for each Travel Post written, so maybe I would owe Osama Bin Laden five dollars. In a way, it could be good to outrageously steal photos; Murdoch or some huge newspaper could sue me. The publicity alone would be ten times more valuable than the punishment. I have been sane about this ever since I took my first photo and put on the internet. I accepted, it is not possible to stop, so just give the people permission to use the photos. Then hope they obey the rules. More or less, you can use most anything; just make a functional link back to my site. This post is a brazen effort on my part, to hop on traffic to the stories that will appear today about Osama Bin Laden, saying that he is behind the Christmas Day underwear bomber. Then throw in a little photo writing education, double my earnings. Personally, I am into open source as much as possible. I think the copyright laws in the US are opressive to free thinking and are only meant to stiffle free trade. I understand that people need to make a profit off their ideas, but the does a book or song really need to be copyrighted for the life of the author +50 yrs? Basically, to me that reeks of an endowment not a copyright. The idea of America is to make it on your own, not on someone else's money (no matter what corporate America thinks). Anyhow, now off my soapbox, I will say that I personally don't care if people use my photos. As long as you are not directly making money off the image (ie using it for your product label), all I want is acknoweledgement by linking my website to it. Heck, if you make an advertisement with my picture and put my website at the bottom, I would love the website traffic it would generate! I found Haiti photos of mine on what I guess you call Citizen Journalist site, more or less like the CNN Ireports. I now only found them, they make me pay for the bandwidth without a live link. The bad part, it is incredibly difficult to make money from Internet pages, I am exceptional, but the average 90 percent resort to deceptive ways. Luckily about 99.99 percent of pages cannot make money under any conditions, but the sites that do are always being tricky. I was tricky here, I use the words Osama to get traffic, but then to show a photo tip, sort of a bait and switch. But, I did not point at advertising, I point at something that does not cost, reading the blog. I could do it in a horrible way, and the page you arrive at is one big advertisement meant to confuse you until you click. A Hobo is a person that travels to work. A tramp is a person that travels and won't work. A bum is a person that will neither travel or work. This post was directly tied in with earning money to travel. However, truly on the earth there are very few perpetual travelers who continue to move. Perpetual Traveler, Professional Traveler, a Traveler all these words eventually make one realize we live on the road. The last 10 post or whatnot are about me living as a perpetual traveler, there is no difference, but I am trying to instruct people by example, it is possible to live and travel and also have a normal life. I would jump off a Cliff if I had to write or thinking only about directly related tourist attractions... aggh, looking at Tourist Traps, truly the gutter of the planet. I admit though, Haiti was interesting, and Dominican Republic is highly boring from a culturla point of view. This place is for boring tourist, Haiti was for exploring possible worlds.